The fastest way to open up a story, unleash the passion of characters and uncover story line is to play the "What If" game. For example, your character was in a fight, got scared and ran away. That worked pretty well, but you don't know where to go next. Ask yourself, "What if my character doesn't run away? What if she faces down her enemy?" So you try this new "what if", but the passion still isn't there. What next? A list of What If questions. Ask another "what if" question, such as, "What if the character pulls out a gun?" What if he screams? Rants and rages? What if the character is married? What if the character isn't married? Has children? Has just been fired? What if the character is ten years older? Ten years younger? Has just fallen in love? Broken up with a lover? Divorced? Is about to go into bankruptcy? What if the character is a hit man? Lives in the country instead of the city? Lives in a poor neighborhood instead of a middle class neighborhood? Is really a writer and not a doctor? Is a homeless woman instead of a wealthy suburbanite? Is a thief? Steals out of necessity? Steals for thrills? The "what ifs" are endless! Think of a story or character. It can be one you're working on or you can just make up one right now. Make list of at least ten "what ifs" for the story and character. Which of the "what ifs" sounds the most exciting? Write the story using that what if and see how the story changes. Don't be afraid to overwrite. It is easier to pull back from overwriting than it is to build up from work that is thinly drawn. Expect to write garbage. Don't worry if you find yourself telling instead of showing. In fact, don't worry. If you worry, you won't take chances and you won't have fun. I came across your blog while looking for blogs on writing. 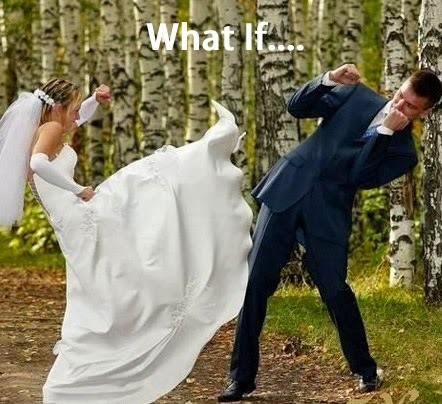 The What if? question can really get me to thinking. My writing is more character driven than plot driven. My usual "what if" questions are accompanied by " how would" the character react in this situation. What if Rose learns her 15 year old daughter is pregnant? How would she react? Rose's reaction will depend on how I have created Rose, a loving, forgiving parent or as a rigid, religious and demanding parent. I look forward to reading more or your blog. Thanks for you comment. Great What Ifs!